After a quiet summer season we are getting ready for a busy fall semester. If you live in the Vancouver area please drop by at our Info Session on August 31. 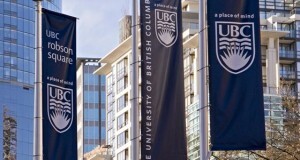 I am also teaching a new course “Discovering Gems and Jewellery” as part of UBC’s (University of British Columbia) Cultural Enrichment program at Robson Square in Vancouver, B.C. ; there is a section in English and in Mandarin interpreted (study materials in Chinese). Mark your calendar for the GIT 2012 conference in Bangkok, Thailand (December 12 – 13); I will be attending and have submitted an abstract about “Raman Spectroscopy – a powerful tool in gemstone identification”. More info to follow in the next GL Newsletter September 2012. We have scheduled the annual info meeting for Friday, August 31 from 1:00 – 5:00 p.m in Room C-010 at UBC Robson Square, 800 Robson Street, Vancouver. Prospective C.I.G. students can pre-register in person for local C.I.G. courses and pick-up study materials and text books if already registered. Please consult the 2012 schedule for Vancouver classes. During the info session we will demonstrate the GL Gem Raman and the GL Gem Spectrometer; visitors are welcome to bring interesting samples – in particular jadeite pieces as we are conducting a study for proper identifcation and treatment detection. Please contact us at (604) 530-8569 for further information. Gemstones have intrigued us throughout history and are reputed as symbols of wealth, power, healing and love. In this course, students explore the unique properties of gemstones that affect their value and study the locations where they are found. Participants will board a virtual tour of splendid gem collections found in museums around the world and discover the challenges in differentiating between natural and man-made gem materials. In addition, advice will be given for purchasing jewellery at various venues such as at auction. Instructor: J. Wolf Kuehn, B.A., M.A., Dipl.oec., F.G.A., F.G.G. Join the growing number of GL Gem Spectrometer users around the world. For a limited time save $ 100 during our Second Anniversary Sale (until August 31, 2012). Click here for more information. The GL Professional Refractometer (on-line price $ 369.95) is in stock again. We have tested all the “jadeite” specimen in the C.I.G. gem study collection but so far not encountered omphacite. 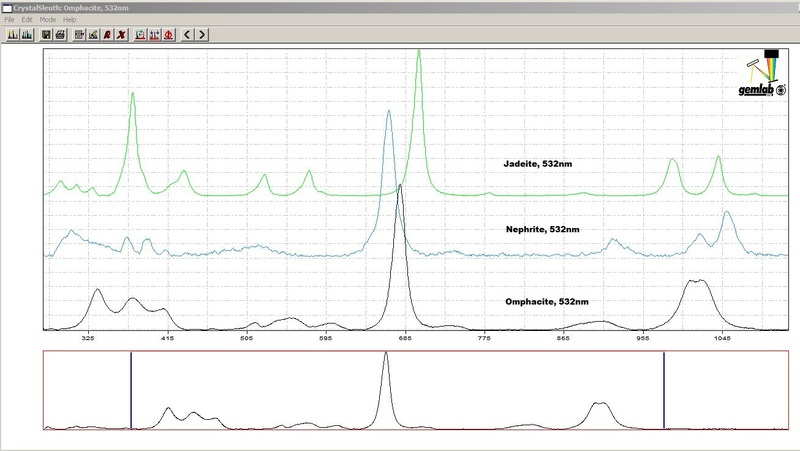 There are 2 Raman spectra for omphacite provided in the GLGemRaman database; users should not have any difficulty in separating jadeite from omphacite. An update is available in the GLGemRaman Support section. “GIA’s laboratory reports will now call such stones omphacite jade. In doing so, we are expanding the term jade to encompass more minerals than just jadeite and nephrite, including those stones that test gemologically as jadeite but are actually omphacite”. 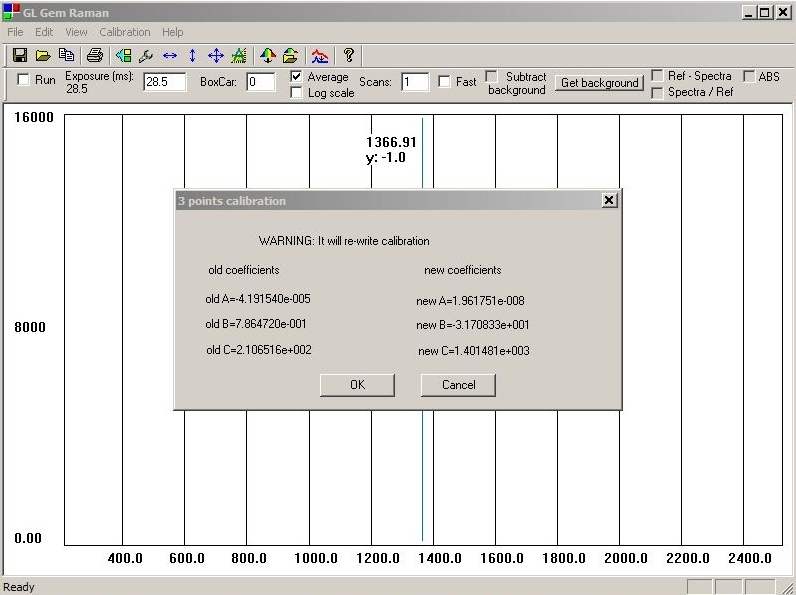 All GL Gem Raman users should have received version 1.4 of the GLGemRaman software; it has an automatic calibration feature built into the software using a calibration sample. This should be done from time to time to get best matches with the RRUFF databse. In case the unit has been exposed to severe physical/thermal shock a more comprehensive optimization procedure should be conducted by an experienced technician. We have presently support personnel in Canada, USA and Germany (for European clients). Please contact us for more information at (604) 530-8569. I have been using the GL Gem Raman for the last 6 months checking stones in the C.I.G. 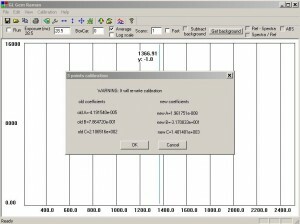 gem study collection; the instrument is an enormous time saving device as it eliminates the use of all other gem testing instruments in many cases. It takes me less than one minute to identify a gemstone (even if set in a piece of jewellery) as to what it is. Of course the microscope is still absolutely necessary for final identification if the stone could be man-made. For highly fluorescent materials (Raman signals are weak and can be “overwhelmed” by fluorescence) the intensity of the laser has to manipulated to get acceptable results; or as an alternative the GL Gem Spectrometer can help. In general all advanced gem testing instruments have advantages and disadavantages but in a busy lab situation a Raman is an extremely valuable tool and can pay for itself quickly. The Gem and Jewelry Institute of Thailand proudly announces the 3rd International Gem and Jewelry Conference or GIT 2012, the third of its kind after the successful predecessors’ GIT 2006 and GIT 2008. It is another GIT’s landmark technical event to be held from December 12-13, 2012 in Bangkok, and followed by a post-conference excursion option to visit Chanthaburi, and Pailin of Cambodia during December 14-16, 2012. Prerequisite: “Gemmologist” certificate or similar gemmological qualification. 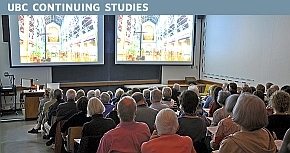 Fee: $ 995 includes comprehensive study guide, Gemstone Inclusion Library, use of lab equipment and study stones. 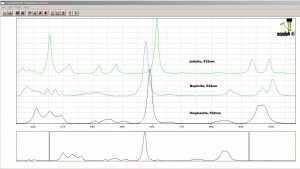 In this course students will learn state-of-the-art techniques including immersionscope, konoscope, advanced spectroscopy, etc. designed to identify confidently any gemstone encountered in the industry. Between 100 and 120 challenging gems including the most recent synthetic and imitation gem materials are available for testing. Here a brief list of man-made gems in our study collection: Chatham, Kashan, Ramaura, Knischka, Lechleitner, Regency, Biron, Lenix, Gilson, Tairus rubies, sapphires, emeralds, alexandrite, opal and many others. Gem enhancement techniques such as heat-alteration, surface colour diffusion, irradiation and glass filling are studied. 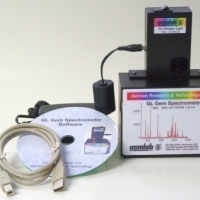 Hands-on exercises with our portable GL Gem Spectrometer and GL Gem Raman system. Practicing gemmologists may use this lab class to up-grade their skills. This course is for current or future users of the GL Gem Raman system. Using PowerPoint presentations the development and use of Raman spectrometers is introduced. Practical testing of a number of interesting gem materials by the participants under supervision of the workshop facilitator. Fee: $ 295 (limited to 5 participants). To register on-line go here. We reserve the right to cancel courses if there is insufficient enrolment; upon return of all course materials students will receive a full refund for the tuition paid but no other compensation can be offered. Please wait with travel arrangements until final confirmation. For more info about the C.I.G. Professional Development Program (AG-PDP) go to Advanced (GEM 200-level) Courses or download brochure (PDF). If you have a cellphone scan the QR code and you will be taken directly to the website of the Canadian Institute of Gemmolgy.